Project Bidding – AAA Partnership Pvt. Ltd.
Procore's construction project bidding tool lets you quickly see which vendors have been invited to bid, the vendors that have declined to bid, and the vendors that still have bid information outstanding. Procore is flexible enough to allow bid due dates and times to be set for all vendors, or just for specific vendors. If desired, Procore can automatically send out bid countdown emails to ensure that your vendors know a bid due date is approaching. Providing the address of a job site enables Procore to select vendors who are located within a specified proximity to the project. Procore can also send bids only to union vendors, or specific CSI codes. 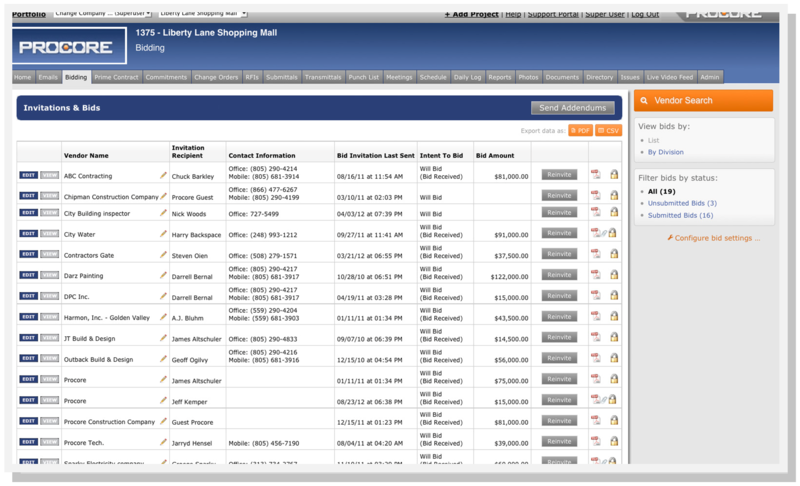 Procore's construction project document archive acts as the source for your bid packet document. Include any type of electronic document in your bid packets, including plans, specs, PDFs and other file types.